Barry Roche looks set to return for Morecambe at York City. Barry Roche is set to return in goal for Morecambe at York City on Saturday. 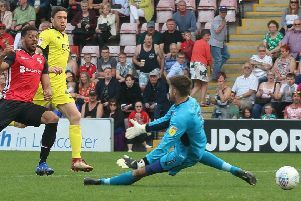 The Shrimps number one limped out of the much-needed win over Dagenham & Redbridge two weeks ago and missed the Johsntone’s Paint Trophy exit at Fleetwood last Tuesday night. Tony Thompson has deputised as the club’s medical staff got to grips with a back problem that was also troubling Roche’s hamstrings. But the popular stopper has come through a couple of days’ training and looks set to be fit for the trip to League 2’s bottom side at the weekend. The Shrimps will continue to assess Tom Barkhuizen who limped off against Fleetwood with a dead leg but Aaron Wildig who came out on the wrong end of a strong challenge late on at Highbury will be fine for Saturday. Aaron McGowan could also return but the game may come too soon for Andy Fleming. Boss Jim Bentley said: “We’re looking okay. The Shrimps head to Bootham Crescent with new boss Jackie McNamara having lost all seven of his games in charge, part of a club record nine straight defeats for the struggling Minstermen. Bentley however knows every side in League 2 pose their own dangers with York fighting for their Football League lives. He said: “You can never underestimate anyone. “They are a team struggling at the wrong end of the table but they’ve got a new manager who has made plenty of changes personnel wise. “Any team can click and win games at our level. “We always respect the opposition and they’ve got good players who can hurt us.